This is a scalable context timeline. It contains events related to the event November 2006: 9/11 Hijacker Associate El Motassadeq Convicted in Germany. You can narrow or broaden the context of this timeline by adjusting the zoom level. The lower the scale, the more relevant the items on average will be, while the higher the scale, the less relevant the items, on average, will be. 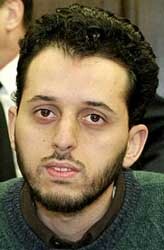 Mounir El Motassadeq, a former associate of three of the 9/11 hijackers, is convicted of assisting the 9/11 attacks. The conviction is handed down by a federal appeals court in Germany, where El Motassadeq had known the hijackers. El Motassadeq had previously been convicted of being a member of a terrorist organization (see August 19, 2005), but was acquitted on similar charges of assisting the 9/11 attacks (see March 3, 2004). However, the appeals court decides this decision was wrong and that El Motassadeq should be convicted for being an accessory to the murders of the 246 people killed on the airliners on 9/11, although sentence should be imposed by a lower court. El Motassadeq admits having trained in Afghanistan and having known three of the hijackers—Mohamed Atta, Marwan Alshehhi, and Ziad Jarrah—but says he knew nothing of their plans. However, the court finds he did know they intended to crash airliners and assisted the hijackers by transferring money to them and making it seem like they were still attending university in Germany. As El Motassadeq did not know the planned targets, he cannot be convicted of assisting the murders of the thousands of people who died in the World Trade Center and Pentagon. [New York Times, 1/9/2007; Associated Press, 1/9/2007] El Motassadeq will later be sentenced to 15 years in jail for the offense (see January 8, 2007).